The news that China has deployed bombers and cruise missiles to contested reefs and islands in the South China Sea has caused significant concern. The move allows Beijing to target ships in disputed waters with a missile capable of maneuvering around defence systems at Mach 3. It has also placed northern Australia within reach of Chinese warplanes. The deployment has certainly changed the regional strategic picture. Yet modern conflict, as practiced by revisionist states like China and Russia, doesn’t often pit conventional capabilities head-to-head. Instead, those nations change facts on the ground (or sea) and influence opponents’ decision-making while keeping their actions ‘plausibly deniable’, or short of a reaction threshold that might bring superior Western militaries into open conflict. Beijing, for example, has used fishermen, armed paramilitary vessels, media, and psychological and legal tactics to the same effect as missiles and planes. It’s also advancing in another domain that is comparatively less discussed—underwater. As Andrew Davis and James Mugg observed in ‘The next big grey thing’, the world’s oceans are one of the last places left to hide something as large as a ballistic missile submarine (thanks to the poor propagation of light and radio waves through water). The challenges of ‘seeing’ underwater mean it’s still possible to float about near an American aircraft carrier or downtown Stockholm in a metal hull the size of six double-decker buses and remain undetected. The opaqueness of water is perfectly suited to ‘hybrid’ strategies that use plausible deniability as a modus operandi. So what might Beijing’s hybrid strategy look like under the waves? 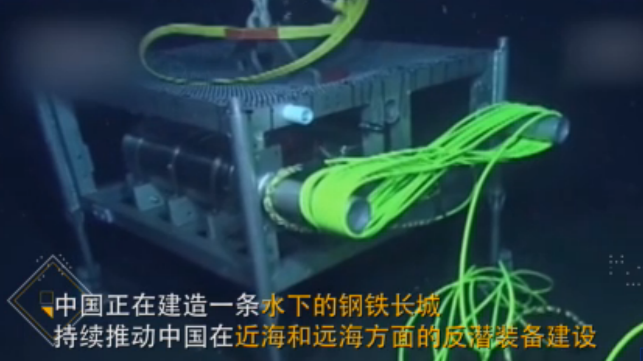 The People’s Liberation Army is busy expanding its undersea toolbox. It has developed autonomous undersea gliders that can dive six kilometers deep to undertake sonar countermeasures, track surface and subsurface targets, or create a surveillance network that may enable over-the-horizon torpedo launches. In addition, it’s rumored to be building an ‘underwater Great Wall’ of seabed sensors that feed into fiber-optic cable stations on the same reefs housing the latest missiles. Other states’ capabilities also indicate platforms that Beijing may possess. Russia’s Main Directorate of Deep Sea Research, for example, operates at least two vessels—the surface ship Yantar and a converted ballistic missile submarine—believed to be equipped with unmanned underwater vehicles (UUV)s that can manipulate objects on the ocean floor. It’s not unreasonable to assume that the PLA is developing capabilities similar to those of the Yantar or even of the USS Jimmy Carter, which is rumored to be able to tap undersea cables and deploy UUVs, although little open-source evidence is available. This pattern of investment suggests three strategic goals. First, the PLA is advancing its ability to monitor vessels passing through contested waters. If reports of the underwater Great Wall are reasonably accurate, then the system would give Beijing unrivaled information about submarine and surface vessel movements in the South China Sea. Like air defense identification zones, the system strengthens Beijing’s de facto control over its maritime claims—a key component of the idea that legitimacy is granted by facts, known as doctrinal unilateralism. Beijing may be hoping that if it controls a contested area for long enough, its claims will eventually gain legitimacy. Second, Beijing is seeking to raise the costs of foreign intervention in a conflict in the South China Sea, particularly over Taiwan. Chinese strategists will have noted that one reason Russia continues to occupy Crimea is that, as far as Washington is concerned, the costs of re-taking the peninsula are greater than its strategic value. The PLA is investing in underwater assets, alongside other anti-access and area denial capabilities, in the hope that Taiwan falls victim to the same strategic equation. Some argue that it already has. This would facilitate other hybrid tactics, such as incursions by fishing vessels in radio contact with armed coast guard ships. Third, it’s possible that Beijing is seeking new ways of intimidating or spying on other states. The ocean bed is crisscrossed by telecommunications cables that carry 98 percent of global internet and phone data and 95% of American strategic communications. The cables are vulnerable: most are roughly the width of a soda can and covered in a thin rubber coat, and they’re not protected under Law of the Sea conventions. If Beijing has UUVs that can find and manipulate seafloor objects, it could tap into or sever Taiwanese cables in order to exert economic pressure, create a contested information environment (as Russia did in Crimea) or even prevent foreign drones from operating over the South China Sea. There are still plenty of questions. It’s unclear how China’s remote undersea sensors and gliders communicate with one another given the strict limitations that water places on data transmission. The US is also investing in underwater capabilities that might negate the strategic advantage that China’s platforms offer. Yet an opaque environment facilitates an opaque strategy—the missiles and planes deployed to contested reefs are only the tip of the iceberg. Ewen Levick is an international security analyst and the online editor of Australian Defence Magazine. This article appears courtesy of ASPI's The Strategist blog and may be found in its original form here.